A house named Rose Bank appears in the 1841 census of Great Malvern. It was the home of Mary Ann Wilmot the widow of Sir Robert Wilmot 2nd Baronet (1753-1834) of Osmaston Hall in Derbyshire. The Wilmot family lived at Rose Bank from about 1840 to 1880. Lieutenant General Eardley Nicholas Wilmot of Rose Bank was named as a magistrate in the 1873 Post Office Directory. In 1826 his sister Mary Ann married General Sir Richard Church at Worthing. The 1871 census confirms she was the wife of General R Church KCH who was then in the service of the King of Greece. The 1901 and 1911 census recorded Rose Bank occupied by George Silas Guy born about 1837 and his second wife Hannah. George's occupation was recorded as 'managing director of an iron and steel tube manufacturory'. George Guy died in 1912. Rose Bank House, which had double fronted bowed windows offering panoramic views over Worcestershire, and its large gardens were purchased by local benefactor Charles William Dyson Perrins in 1918 and gifted as an amenity to the town of Great Malvern in Worcestershire, UK. Rose Bank was used by the Womens Royal Voluntary Service (WRVS) during WWII, but, according to reports, the house fell into decay and was demolished in 1959, a year after Dyson's death. Rose Bank Gardens, situated above Belle Vue Terrace, to the south of the Mount Pleasant Hotel remain an attractive place to walk, rest, and access footpaths onto the hills. 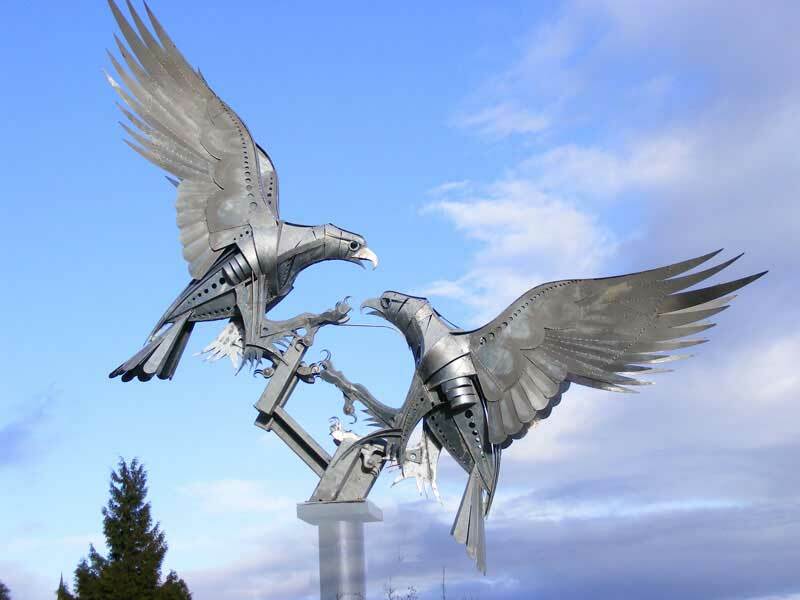 A notable feature is a sculpture of two buzzards in flight, installed in 2012, to mark Queen Elizabeth II's Diamond Jubilee. Nearby are Tourist Information Displays (see outline below). The magnificent sculpture of the buzzards (see photo below) was created by Polish sculptor Walenty Pytel who oversaw the installation. 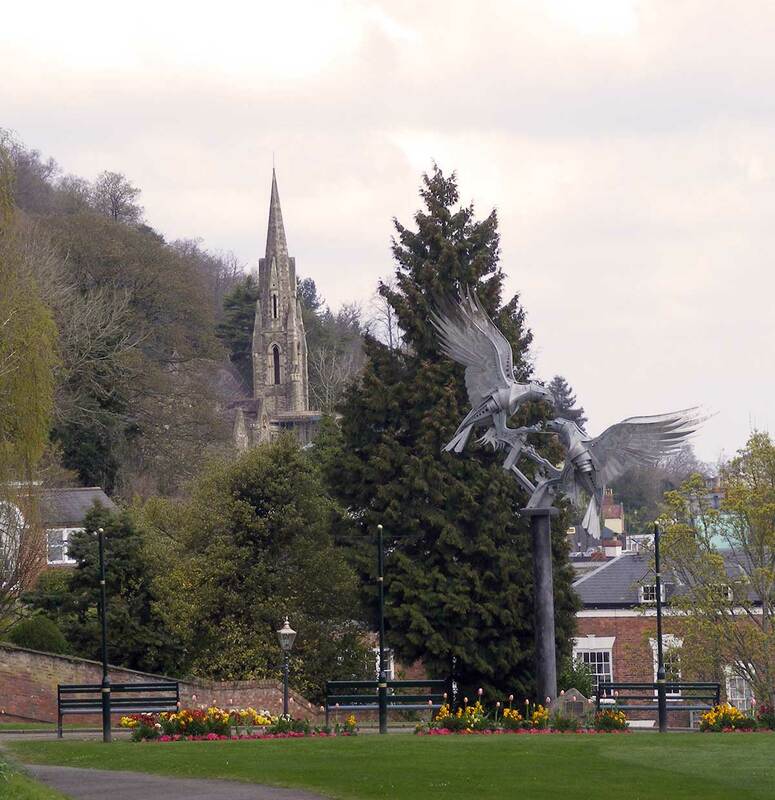 The sculpture was funded by Malvern Town Council, Malvern Hills District Council and private donations. The Malvern Gazette reported it is not the first time that Mr Pytel has made a sculpture to mark a royal jubilee. In 1977 a Silver Jubilee commemorative fountain depicting Great Britain’s heraldic beasts was unveiled outside the Houses of Parliament. 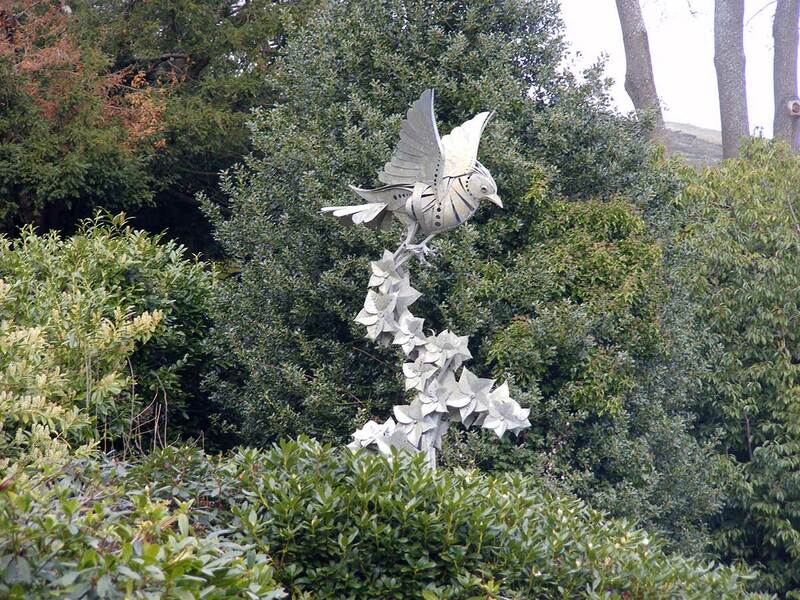 In 2017 another sculpture emerged amongst the bushes in the gardens, a few yards south of the Buzzards - an impression of a skylark. Ask your children to search for it if you visit. The title of the new sculpture is The Lark Ascending, inspired by the poem of George Meredith and the music of Vaughan Williams. 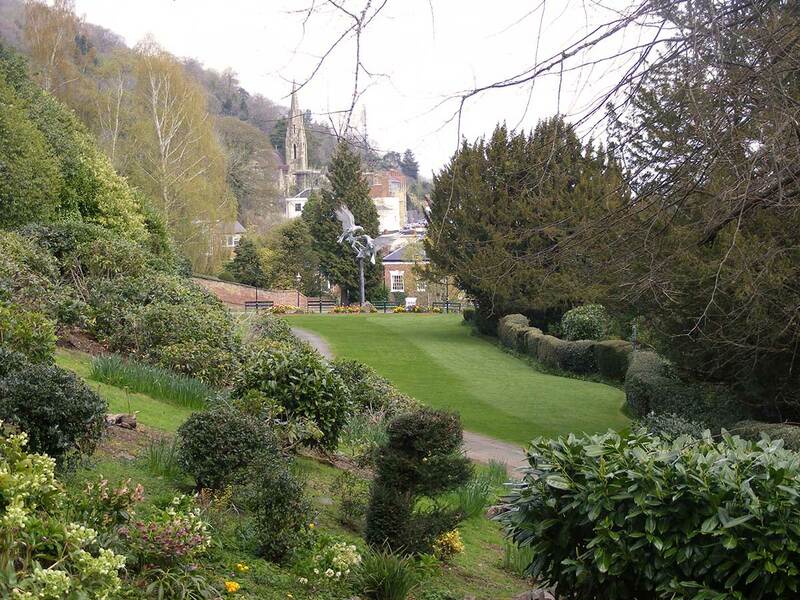 The photo below shows the view from Rose Bank Gardens across the Severn Valley. In the foreground can be seen the Tourist Information Centre and Post Office. Rose Bank Gardens extend over several levels with many zig zag paths to explore; the gardens are at their best in the summer when plants are in bloom and the ground is dry. 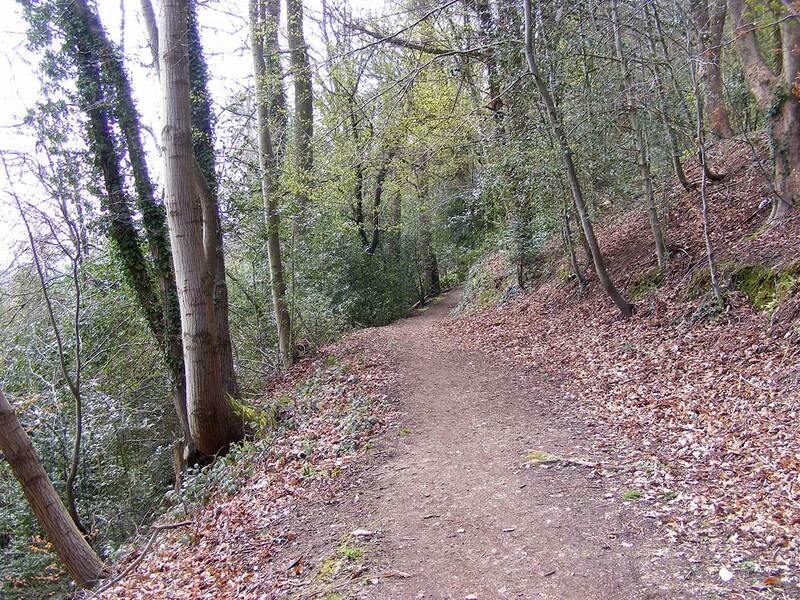 If you follow the path by the wall westwards from the entrance off Belle Vue Terrace, you will reach the ninety nine steps leading to a footpath up to St Ann's Well. The Malvern Hills reminded Lewis of the Mourne Mountains at home in Ireland. A gas lamp appears in his story, The Lion the Witch and the Wardrobe. At Magdalen College, Oxford, Lewis tutored George Sayer 1914 - 2005 who became a close friend and Head of English at Malvern College. 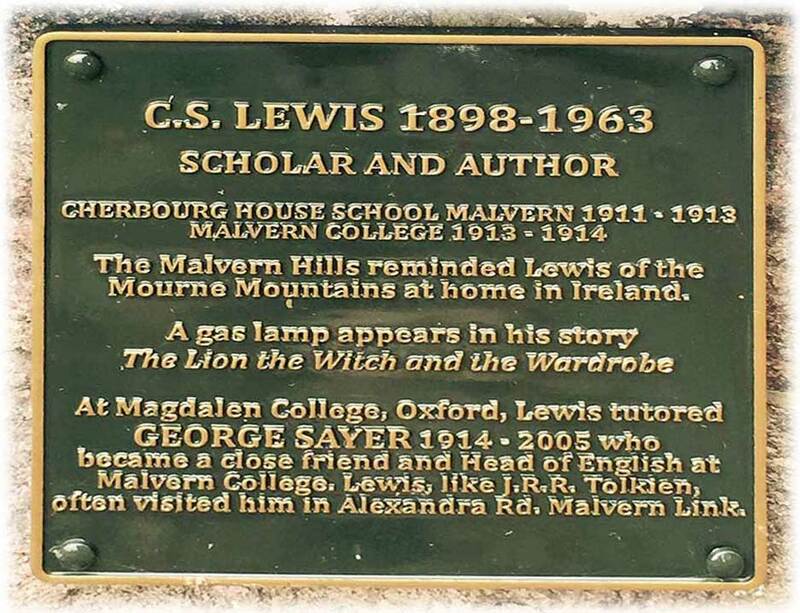 Lewis, like JRR Tolkien, often visited him in Alexandra Rd, Malvern Link. After you have rested at the top of the 99 steps bear right a few steps into Foley Terrace, joining St Ann's Road. At this point you will see a sign pointing the way up a steep zig zag footpath to St Ann's Well where there is a cafe. Alternatively a few yards further on you can turn left up another path onto the Malvern Hills signposted Happy Valley. At the southern end of Rose Bank Gardens there is a gate leading upwards through shaded woodland to Foley Terrace. At the top you can either turn left to follow Foley Terrace to the main road running up to the Wyche Cutting or turn right towards St Ann's Road and thence down past the Red Lion to Belle Vue Terrace. From the top of Rose Bank Gardens it is a steep walk up to St Ann's Well but well worth the effort. Probably not a route to be taken by the infirm, though those with electrically powered mobility scooters and good brakes might be able to make the climb. At St Ann's Well you will find seating and refreshments. See St Ann's Well website for opening times. If you manage the climb you might find it amazing that the Victorian Water Cure doctors encouraged their patients to walk up to St Ann's Well and back before breakfast. At least at that time of day the weather would be cool! From the cafe at St Ann's Well footpaths branch out onto the Malvern Hills, and you can walk up to the highest point known as the Worcestershire Beacon. There was once a cafe here which burnt down in 1989. 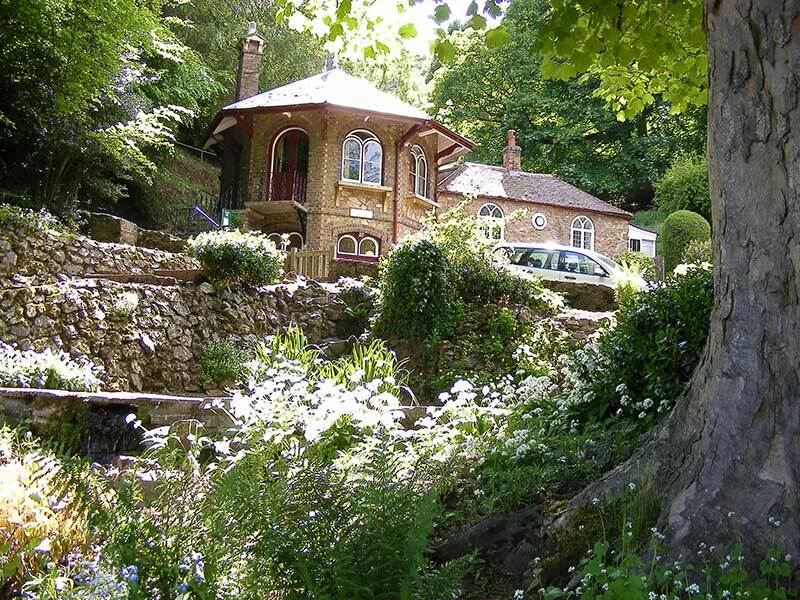 The Malvern Hills Conservators hoped to replace it seeking permission in the 1995 Malvern Hills Act, but this was refused by the House of Lords who felt that needs could be met by the cafe at St Ann's Well. 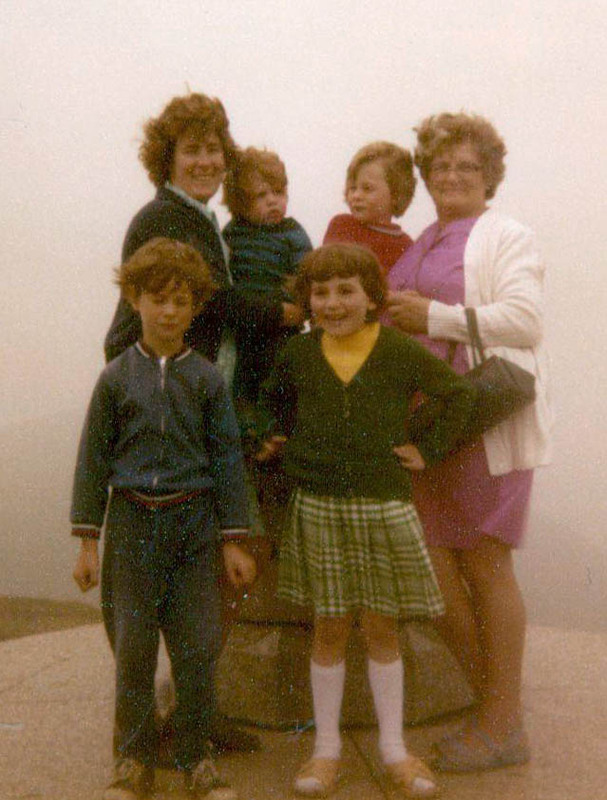 At the Worcestershire Beacon, situated above Rose Bank Gardens, there is a Toposcope which was installed in memory of the Diamond Jubilee of Queen Elizabeth II's great great grandmother, Queen Victoria, in 1897. The Toposcope now bears a copy of the original metal plate showing the landscape surrounding the hills, protected by a circular glass disk, which had an inscription on the top reading 'The earth is the Lord's and the fullness thereof'. The original was stolen in the year 2000, but was later recovered. 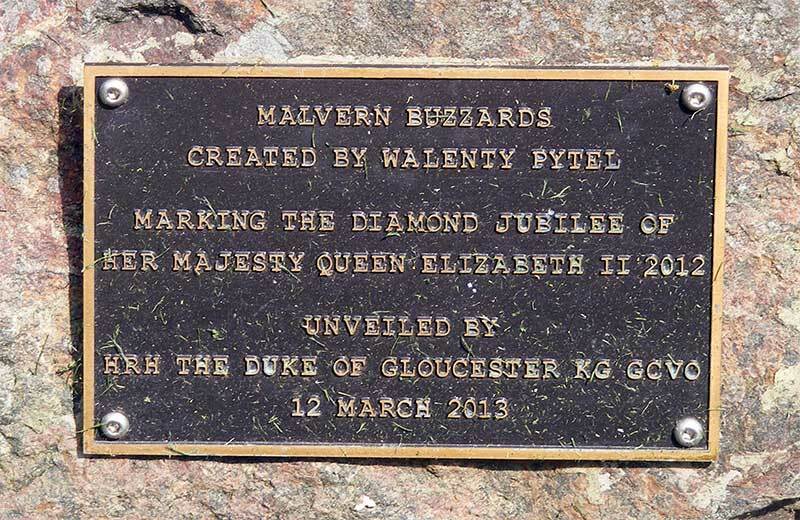 Click to go to Malvern Hills Trust page for more information about walking on the Malvern Hills.